Buying the right skateboard for you can be a tough choice. While it's not the hardest decision you'll ever have to make, it can sure feel like it to a new skateboarder! Finding the right skateboard can be a tough call given the large selection and range of prices. Here are some guidelines for making the right choice. The first thing you need to decide is whether you want to assemble your own skateboard, or buy one that has already been put together (called a "complete"). Either way is fine; it's just up to you. If you are a new skater, you might as well get a complete board as it's a great idea. You'll also need to know your dimensions and this is where a lot of skaters get lost. However, it's a lot easier than it sounds. Here's a little secret -- for your first skateboard, getting the right size and shape is almost impossible. That's because as a new skater, you really don't know yet what you want! That's OK - but here are some general sizes to go by when "Building Your Own Pro Grade Skateboard" -- this articles offer general guidelines for various sizes and brands. Once you've determined size, check out an online skate store, and pick it out! If you want to build your own skateboard, you can just buy the parts that match what you picked out and put it all together or ask someone at the shop to assemble it for you. 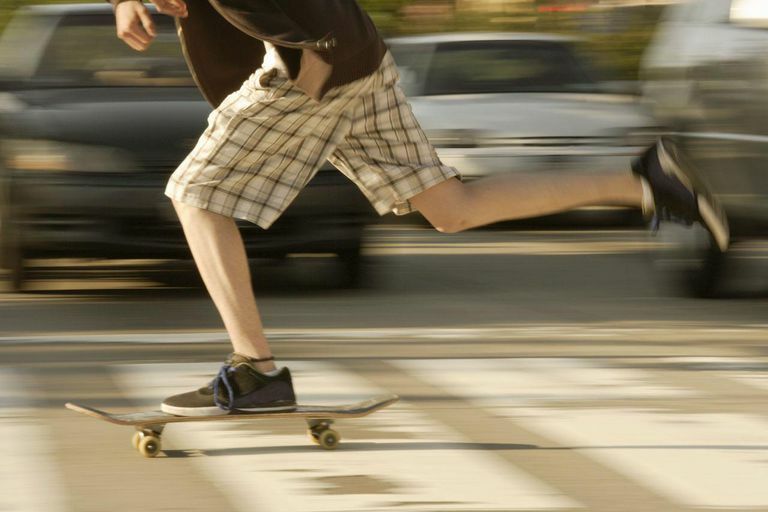 Buying a complete skateboard is usually the easiest way to go if you are a new skater, but the real danger isn't in getting a skateboard that's a little off in terms of size or shape. The real danger is when you get a complete skateboard that's poor quality or junk. There are plenty of these out there, waiting like land mines set for unsuspecting parents and kids. Only, instead of hurting you now, they end up hurting you or your kids later. They are often sold in superstores like Walmart or some large sporting goods store. Sure, not all cheaper complete skateboards are junk ... but it can be tough to tell. Read this FAQ on buying cheap skateboards for more help in deciding if a cheaper board you see in the store is all right to buy. For some suggestions on brands of complete skateboards to buy, read up on Buying Complete Skateboards and Buying Beginner Skateboards for Kids. Whatever you end up buying, keep in mind that it will break. Skateboarding is tough on skateboards. Decks break. That's just how things work. So, whichever way you go, complete or building your own, you are going to have to maintain your skateboard later. That's fine and expected -- so don't worry if you don't think your board is nice enough, and don't spend too much on parts that you'll have to replace.